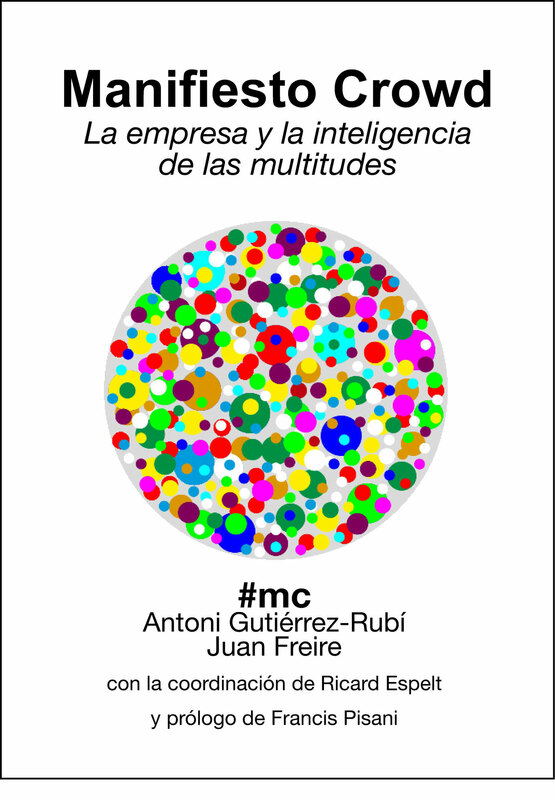 On March 18th, 2013 the second book by Juan Freire and Antoni Gutiérrez-Rubí was published: Manifesto Crowd. The book is available for a free in open source for download on their website, under a Creative Commons License. Manifesto Crowd portrays the authors’ research, thoughts, daily conversations and discoveries on the impact of mass crowd on businesses and markets. Broken into 6 different chapters, the authors explain the reasons behind current change and transformation in businesses: how transformation happens, why it happens, and the reasons behind some businesses apprehesion to change. The creation of the book is a pure and palpable example of coworking and experimentation. Working around the concept of collaboration and their existing project Trends laboratory (Laboratorio de Tendencias), the authors organized three workshops or ´co-colloquiums´. Each one of these workshops brought together groups of thinkers and specialists to talk about specific topics: 1. A look into mass intelligence, 2. Innovation and businness organization, and the final on 3. the Five examples of business and social innovation through crowdsourcing. The outputs and conclusions of these three workshops were poured and writen into Manifesto Crowd, and helped them construct the structure of the book. The authors still welcome the same type of collaboration with their readers, followers and audience… on Facebook or by sharing a hashtag (#mc) where they invite people to help them continue building the 66 sentence Manifesto that concludes the book. Inspiring sentences posted on Twitter and/or Facebook will be added to the already existing list. This is a formula that will make the book more real, and alive. 2. Crowds are not a mob, chaotic, nor a mass, homogenous, they are plural groupsorganized through networks. 3. The collective intelligence is not determined by the individual intelligence of each member of the group. 4. Add and filter individual opinions is only a primary crowdsourcing form that enables confronting simple problems. 5. Complex and undefined problems require communities of practice working through a connected environment to generate real collective intelligence. 6. Communitiescan be excellent in producing efficiency and quality and are therefore a model of the industrial age in its own. 7. When considering a group as a homogeneous mass only statistical data can be analysed instead of the intelligence produced by such group . 8. Having an apparently secure market share but losing our understanding of the society will lead, sooner or later, to to failure. 9. The company of the XXI century cannot stagnate in a security perimeter but should explore the adjacent environment. 10.A business may be closed or open to the outside world, it may drown or transform itself. 11. Businesses must exploit what they know to do, but also explore what might come to know. 12. Be permeable to allow future to sneak into the walls of the present. 13. Facing harsh realities in a liquid society, companies must be capable of adapting to survive. 14. Business connectivity is not about connecting dots, or creatingnetworks … it is about establishing networks to think, develop and access jointly the market . 15. Businesses should be a platform to build an ecosystem promoting opportunities. 16. Crowd companies transform collective knowledge in relationships, organizations and business. 17. Corporate Social Responsibility is the past, business and social involvement are already two inseparable parts of the same strategy. 18. The crowd company transforms competition in competitiveness and rivalry in cooperation. 19. The crowd company is open to the entire world. 20. Hierarchical and efficiency-oriented organizations disconnect emotionally from their employees and their innovation strategies become expensive and slow. 21. When understanding a group as a diverse crowd, true innovation and collective intelligence may arise. 22. Learn to appreciate the emotional intelligence of companies and organizations. 23. In a world continuously changing, continuous innovation is a necessity for survival and no longer a business option. 24. Outsourcing diversity increases innovation and reduces costs but does not solve the pathologies within organizations. 25. True open innovation requires involvement and leadership from the organization. 26. Innovation implies to listen and to open to external inputs, in a gradual way. 28. The classical and linear R & D model is only as small part of the innovation strategy of a few sectors. 29. The new R & D strategy involvesinnovation and design, which areincorporated throughout the whole team of staff. 30. To innovate we must tolerate failure. 31. Failure is just finding solutions that do not work yet. 32. Those who do not fail when seeking innovation strategies have not dared enough. 33. For a business, the best proof of its willingness to innovate is their ability to reward bold failures. 34. The consumerization of technological capacity destroys the competitive advantage of large organizations. 35. It is not smartto nottreat consumers as smart citizens. 36. A small action with many followers will bring great changes. 37. The power of the consumers is very high. When they cannot contribute, they organize and weave their revenge in networks. 38. An effective brand must incorporate into its narrative the emotional relationships with the stakeholders. 39. The governance of a complex ecosystem involving different stakeholders should be the main concern of any organization. 40. The current complexity cannot be controlled by planning, but can be managed by designing structures to allow interactions. .
41. To exploreis essential, over controlling isn’t..
42. A good story indicating the direction is worthier than an outdated plan imposing goals. 43. Users search services and personalized experiences rather than products. 44. The customization requires the active intervention of the user, otherwise it is perceived as false. 46. Innovation requires ecosystems of collaboration and therefore it requires spaces and platforms for interaction. 47. Global Transformation: spaces (coworking), methodologies (design thinking), innovation (crowdcreating) and financing (crowdfunding). 48. Business incubators (twentieth century) are outdated. Open innovation spaces (XXI century) are born. 49. Every innovation is collective and arises from interaction scenarios. 50. Motivated, dynamic and open spaces and interaction between members promote the distributive innovation. 51. In the crowd-society, the culture of use replaces the culture of possession. 52. The ‘commons’ culture is a form of relationship, management and governance and therefore requires rules. It does not have and ideology in itself, but it is not neutral. 53. Collective funding provides commitments, talent and motivation, as well as money. 54. The Knowmads are the artisans of the XXI century: they generate knowledge, create environment and develop processes. 55. Diasporas contribute to creative openness and diversity, therefore, they connect networks. 56. Only from action and experimentation learning (and innovation) is possible. Learning is to undertake and undertake is to learn. 57. The citizen capacity of innovation increases with the access to infrastructures like social technologies and production laboratories. 58. Technologies can be social if they are designed for empowering the citizen, facilitating their autonomy and production capacity. 59. Social technologies increase growthby facilitating the development of new infrastructures by citizens. 60. Communities and networks involved in manufacturing processes are alternatives to the activities that were previously only possible through formal organizations. 61. Communities and networks fulfill the social mission which institutions no longer exert. 62. Contemporary communities are based on practice and multiple free choices. 63. Communities of practice need a ‘commons’ culture that states its objectives, working methods, governance and technology. 64. States and markets are incomplete solutions, the ‘commons’ is essential for a feasible governance of a complex world. 65. We are currently experiencing the transition towards a system of social movements capable of addressing complex problems and generating forms of civic innovation. 66. Only when innovation emerges from citizens thengovernments and enterprises can meet the challenges of the Network Society. This entry was posted on March 22, 2013 by mcquant in News and tagged Book, Innovation, Juan Freire, Publication, Trends.